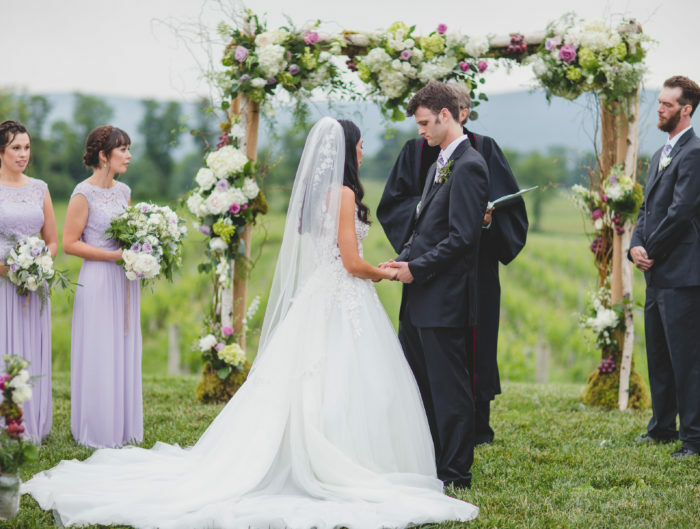 Today’s Washington DC area wedding just gets better and better with each additional detail! 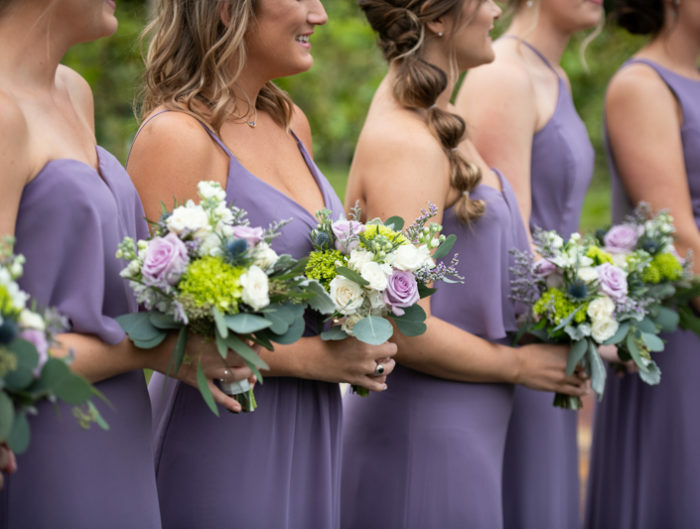 Ashley and Carlin’s beautiful wedding took place last fall at Ingleside Winery in Oak Grove, Virginia, with gorgeous images courtesy of Korie Lynn Photography. And from the outdoor ceremony under an oak tree, to the wildflower bouquets and reception centerpieces, to the chalkboard signs that paid homage to Ashley’s career as a middle school teacher, well, I’m kind of in love with the entire wedding! From Korie: Ashley and Carlin’s wedding had a relaxing, laid back atmosphere throughout the entire day. One of my favorite details was the involvement of the local farmer’s market. Ashley met a woman at the market who agreed to supply flowers for her wedding from her own backyard! The variety she provided was amazing! The ceremony took place in the horse pasture under a huge oak tree on the grounds at Ingleside. One of the special details in the wedding was the use of Ashley’s grandmother’s brooch. She wore it on her sash that was beautifully tied in a half bow around her wedding gown. Ashley is a middle school teacher, and decided to use small chalkboards throughout the reception as part of the decor. I thought that was such a subtle way to tie everything together! For their guestbook, instead of anything traditional, they opted to have their guests sign fabric memory squares that would later be worked into a wedding day quilt for the couple. Simply stunning! Thank you so much Korie and a huge congrats to Ashley and Carlin! 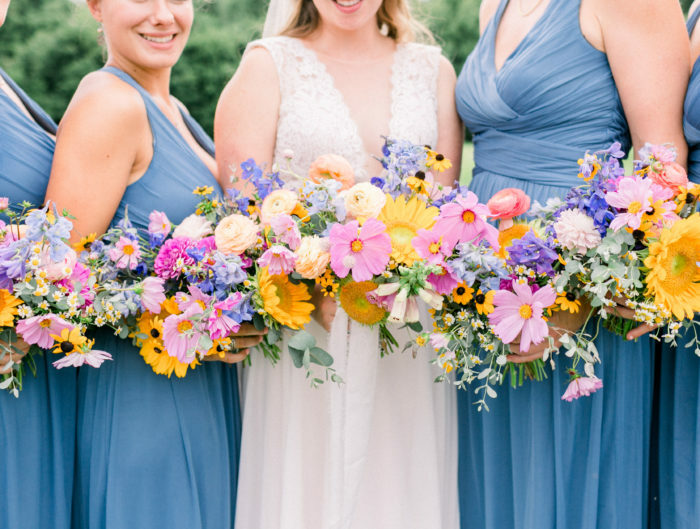 Don’t forget to visit our vendor guide for more fabulous Virginia and Washington DC-area wedding professionals or our real wedding gallery for more beautiful weddings! Make-up by Dawn Petrey, Bella Hair of Fredericksburg. Super long shot as I am not sure this will be read by the bride or anyone who knows… but where is the dress from? I’ve been looking for one like it everywhere!!! Would love if someone could let me know! Thanks! also where did you rent your chairs from please?